Smart investors know that the key to choosing which stock to buy or sell is a proper analysis of every stock’s price history. Even if you have heard rumours about a particular company that imply its explosive future growth or its imminent demise, these rumours would have already left their footprint on that company’s traded stock price. 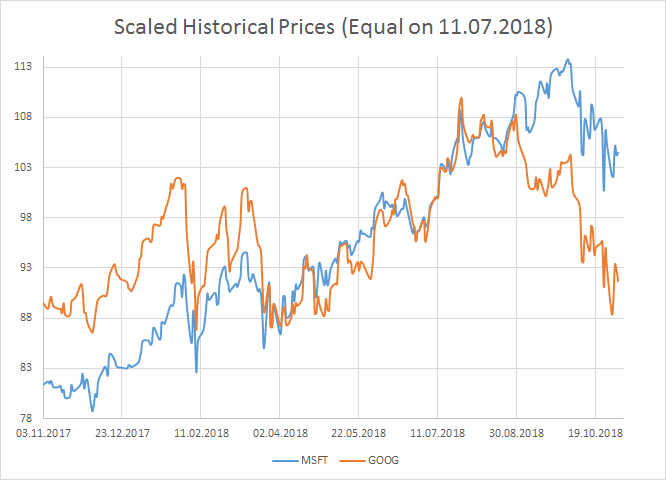 Market is as fast – if not faster – than rumours! It is therefore important that you have access to both real time and historical data of all those stocks that fall under your radar screen. 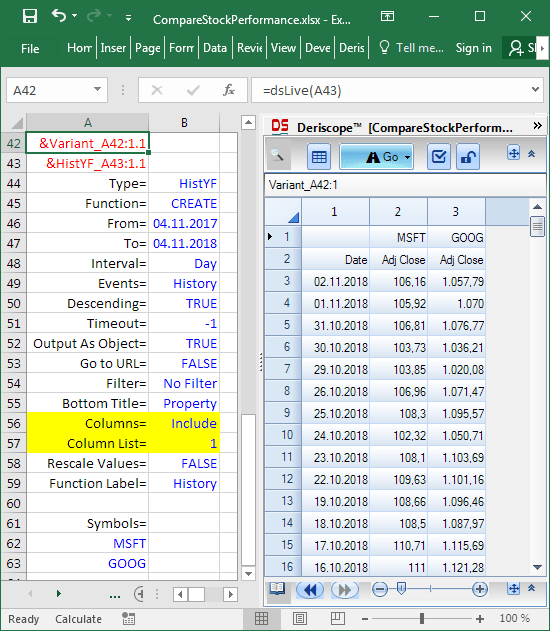 In my previous article about live feeds in Excel I explained how you may get access to such feeds. 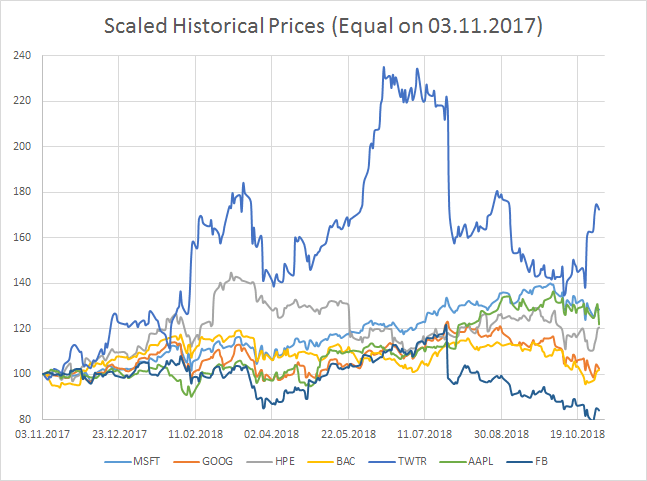 In the current article I will confront the question about how you may analyse the historical data of several stocks in order to pick up the one with the best future prospects. You might have heard that professional traders go one step further and apply some sort of mathematical transformation on the raw stock prices to produce a time series of numbers, called technical indicators. Many online brokers even supply you with ready-made popular indicators, like Moving Average, MACD (Moving Average Convergence Divergence), RSI (Relative Strength Index) and OBV (On-Balance Volume). If you think these tools could help you make a profit, think again! These indicators are so commonplace that whatever they imply for the stock’s prospects is already priced in the quoted price before you can blink your eye! In other words, if they convey a positive signal, the market will swallow enough buy orders to raise the stock price to a level that is not still a bargain by the time you look at this signal! Because professional traders know this fact, they use their own custom technical indicators either by devising unique mathematical algorithms or tweaking those already in place. Guess what? You need to do the same! 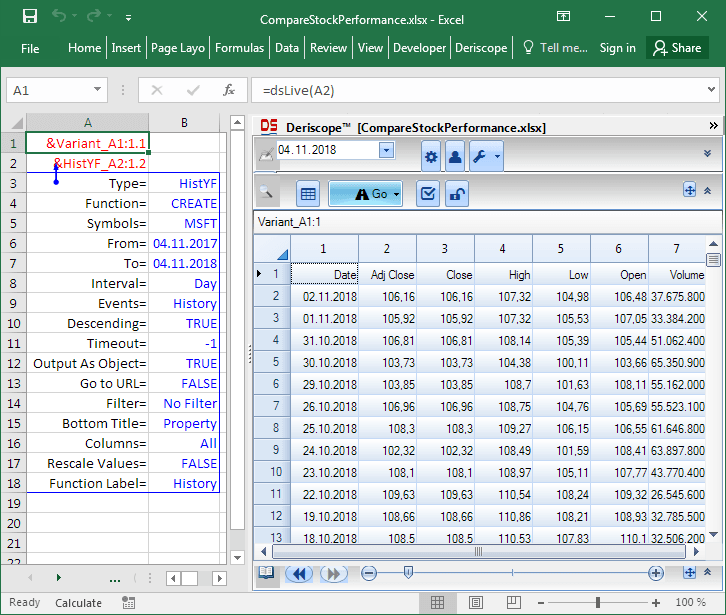 Not of course by solving differential equations, but by building your own custom analysis in Excel. All you need is some sort of utility that can dump the raw numbers in your spreadsheet. Then you could make yourself a cup of coffee to boost your imagination, raise your sleeves and beat everybody else! You can do it because Excel puts you in front of the steering wheel and lets you manipulate the data in any way you want. Great! Right? But still, wiser have you not become! What you really want, is having two curves plotted against each other on the same space. 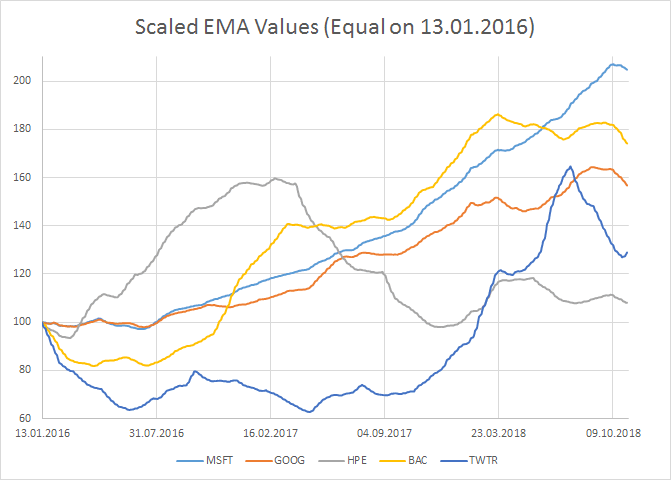 Rather than relying on broker toolkits, how about plotting the chart yourself? All you need is having two columns of prices in an Excel spreadsheet and create a two-curve chart out of them. 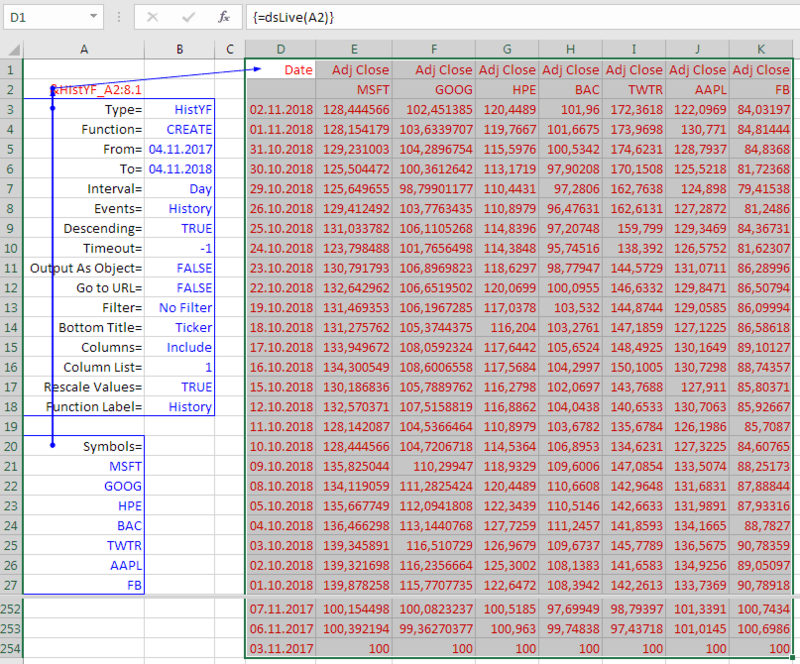 While you can easily download the historical prices from a site such as Yahoo Finance, I would advise you to use the Excel Deriscope Add-In because a) is made by me :-) b) comes with an integrated wizard that greatly assists you with the analysis of market data in the spreadsheet c) supports several live feeds providers d) is locally installed (not SAAS), which means nobody can spy on your data and e) is practically free with a very low one-off price for lifetime ownership. The first formula in cell A2 is =ds(A3:B18) and returns the text &HistYF_A2:1.2 that is a unique label of an object that contains the specifications of your historical data request to be sent to Yahoo’s server. 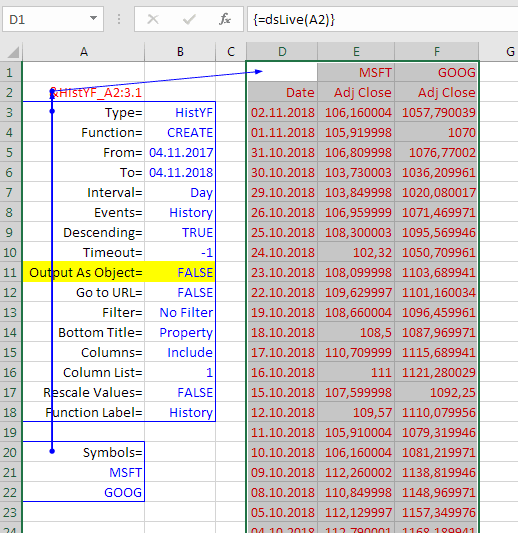 The second formula in cell A1 is =dsLive(A2) and does the real job: It contacts Yahoo’s server with the request defined in its input argument A2 and returns the text &Variant_A1:1.1, which uniquely identifies the object that contains the received feeds. Before showing you how to place the received feeds in the spreadsheet grid so that you can work with them, let us try to add a second ticker symbol in the request object defined in cell A2. Below you see one possible method that can be readily extended to handle many more additional ticker symbols. 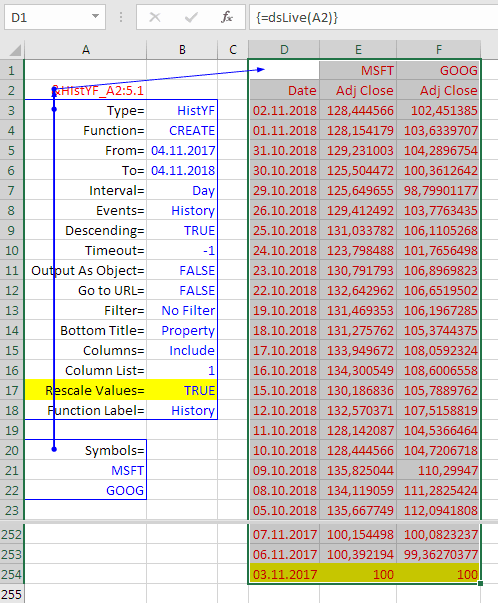 The ticker symbols (here MSFT and GOOG) are entered under the Symbols= key in the yellow highlighted rows. As before, the request is sent to Yahoo’s server through the formula =dsLive(A21) in cell A20 and the wizard displays the received feeds because cell A20 is currently selected. 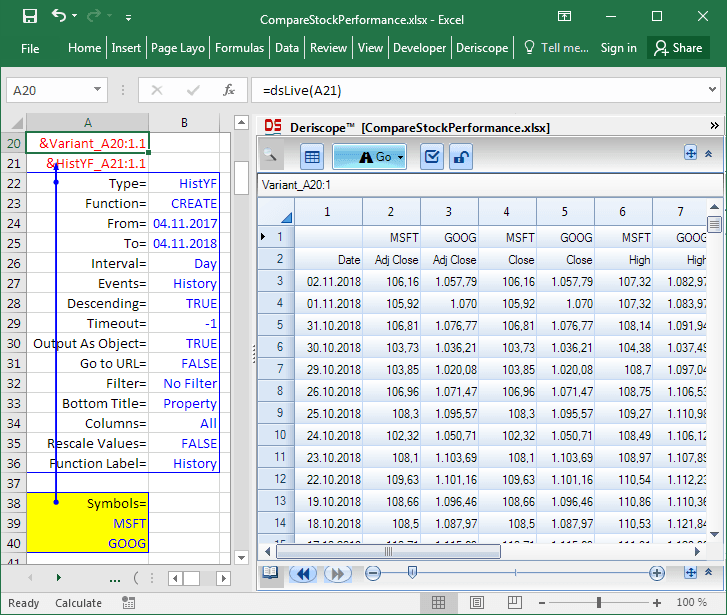 Due to the existence of two tickers, the output table now consists of 13 columns: The date column plus 6 columns per ticker. 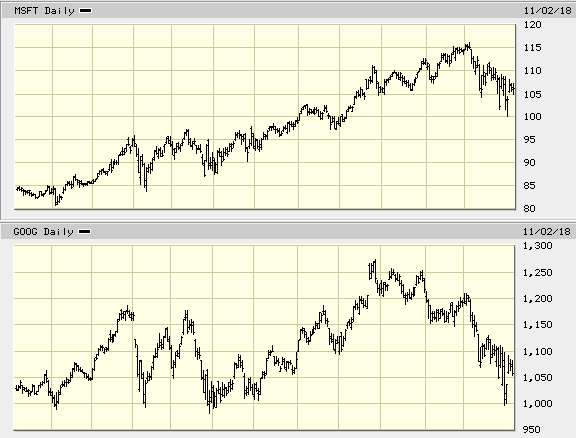 Chances are that you don’t want to mess with all these columns, especially if more than two stocks are involved. In most cases you would rather focus on only the first group of columns that report the close prices adjusted for dividends and splits. Now is the right time to think about transferring to the spreadsheet grid the feeds currently displayed in the wizard, so that you can start doing some useful work with them. 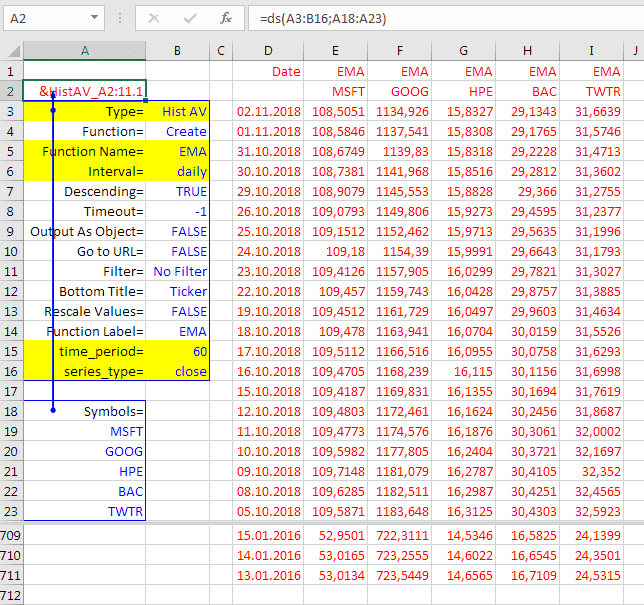 While you may copy the taskpane data and paste them subsequently in the spreadsheet as values, what you really want is a spreadsheet formula that returns the feeds while being linked to the request specifications held by the object &HistYF_A43:1.1 in cell A43. While this method is convenient for getting the spreadsheet array formula with the correct size (254 rows and 3 columns in this example), it is probably simpler and more efficient to avoid creating the data object in cell A42 and instruct the formula dsLive() to return the received feeds directly to the spreadsheet. 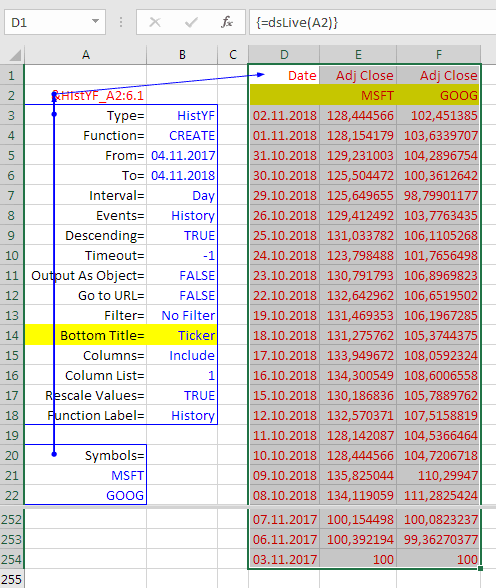 Do not even try to create a chart in Excel with two curves representing the adjusted close prices of MSFT and GOOG! 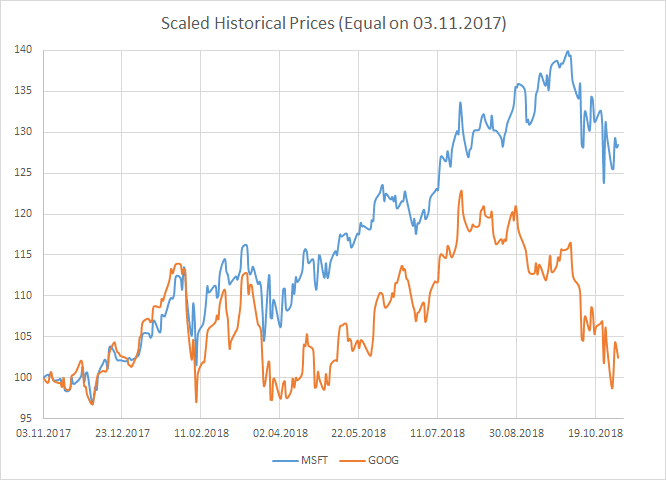 The vertical axis would need to include the range from 100 to 1,000 in order to accommodate the prices of both stocks. As a result, the MSFT curve would appear as a flat line at the bottom of the chart due to its variations being hardly visible. The above techniques are not limited to stock prices. 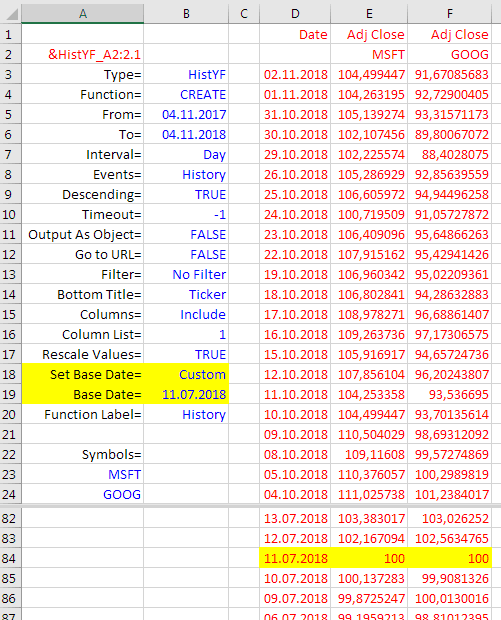 Historical time series of over 50 technical indicators are available through the Alpha Vantage provider and may be dumped in the spreadsheet in a similar fashion. 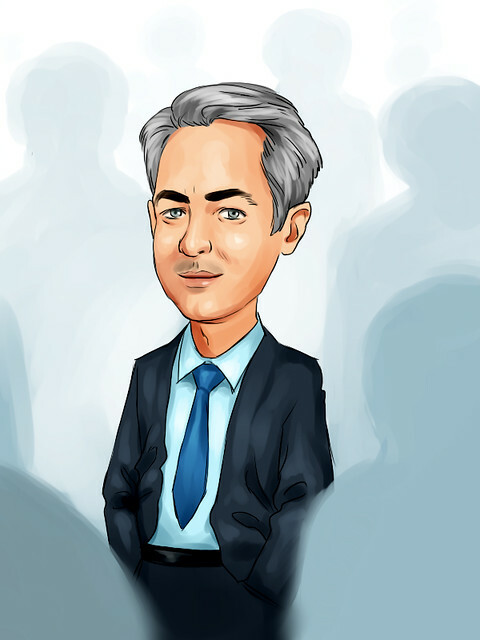 Author: Ioannis RigopoulosFounder of deriscope.com, a site dedicated to the precise pricing and risk management of financial derivatives in Excel by means of the proprietary Deriscope wizard interface. In the past, held senior quantitative, front and middle office roles in the trading floors of major banks in New York, London and Frankfurt, with the last position as global head of the Fixed Income and Credit Derivatives Phi team of UBS in London.